Disclaimer:Some information and screenshots have been redacted to cover BHGE intellectual property policies. The thoughts expressed in this case study are my own and do not necessarily reflect those of the client and their business. The designs, content and any other assets belong to the company in mention and should not be copied or re-used in any way. 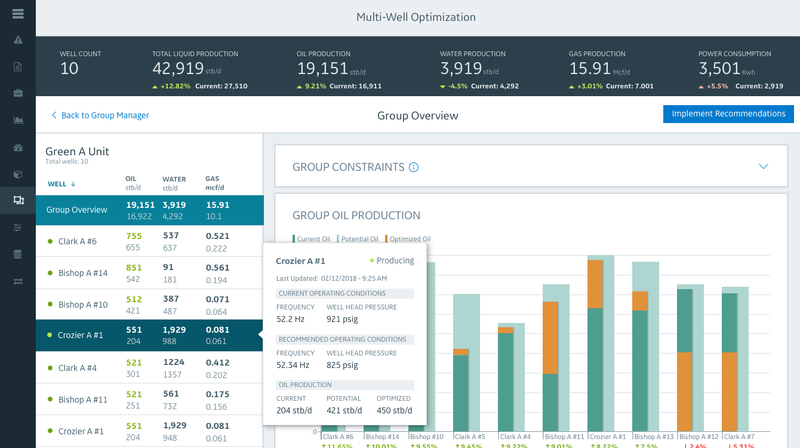 Helping overworked production teams make smarter and faster decisions on how to optimize their wells to increase production and meet monthly goals. With a continual reduction in force and an increase in producing oil wells, it’s imperative to ensure wells are always up and running at their full potential. Production teams are responsible for meeting monthly production goals. 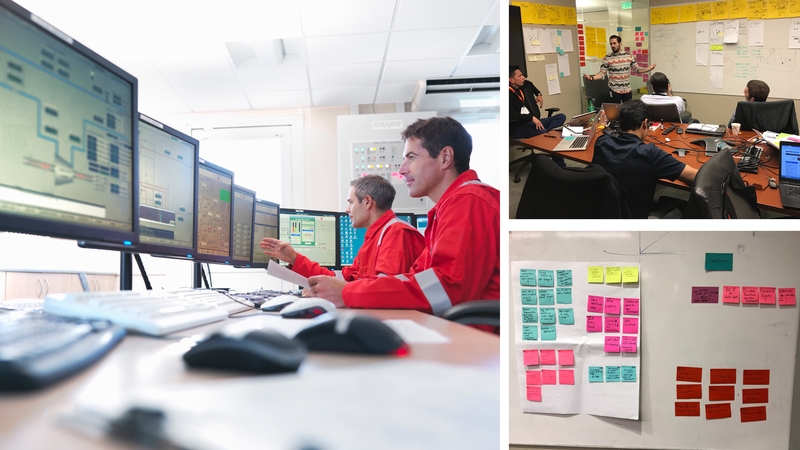 A Production Engineer’s primary goal is to optimize his or her wells to get the maximum amount of production. Most engineers have to manually run production simulations which is extremely time consuming and takes away from focusing on other time sensitive tasks. Typical Production Control Room requiring the use of multiple applications to complete daily tasks. This project took place between December 2017 and May 2018 while employed at GE Oil & Gas. I took on the Lead Product Designer role. I worked in a medium size, multidisciplinary distributed team with internal Subject Matter Experts, Key Stakeholders, 2 Product Managers, UX Researcher, Prototyper, Content Strategist, 1 Scrum team, Data Scientists and another Product Designer. I was responsible for the overall design direction and vision, including interaction design, visual design and supporting UX research. 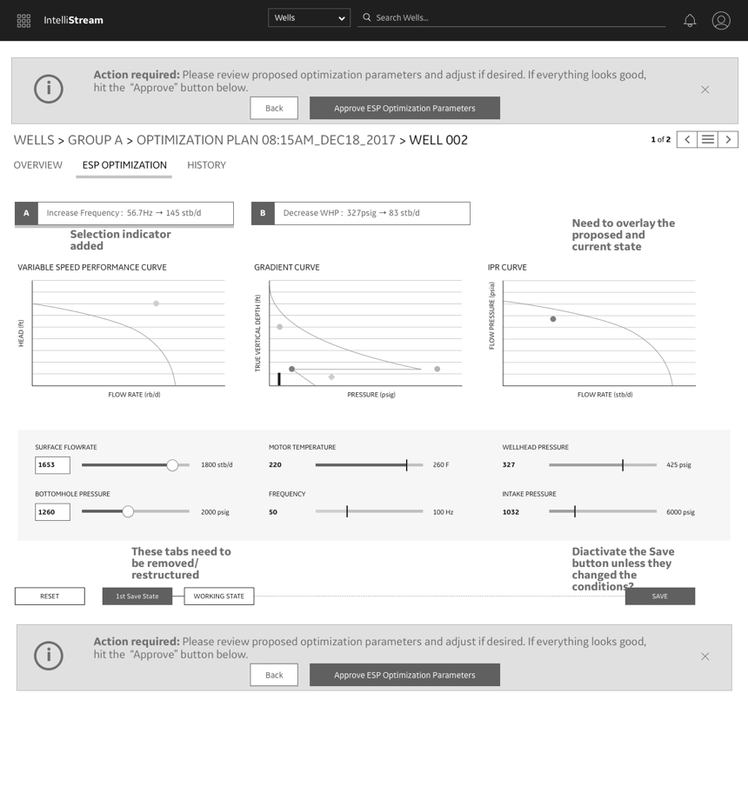 Final design for MVP Group Optimization Overview page. 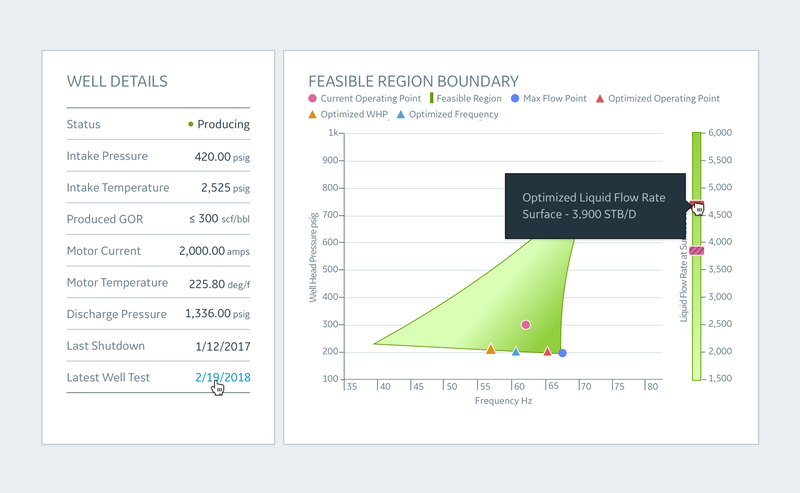 In favor of speed to market, we were tasked to design and build Multi Well Optimization within the existing product architecture. This tactic was considered to be the most advantageous with the least risk. 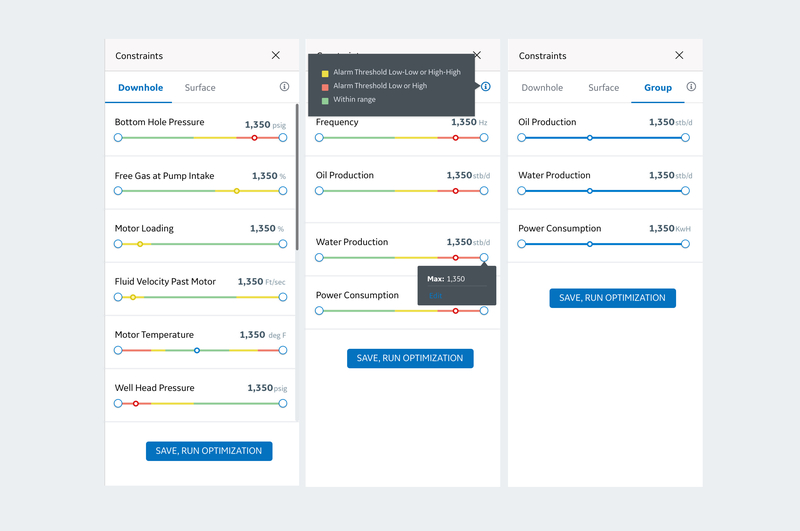 Given the current state of the Oil & Gas industry, having a tool that could offer a variety of optimization recommendation plans allows engineers to use this tool as a 100+ man workforce. The greatest value added was evaluating and approving recommendations that a user could then implement, plan and monitor the impact. The system will then continue to learn from the user’s decisions resulting in smarter recommendations offered, yielding a higher return. Our lack of domain knowledge around Multi Well Optimization meant we needed to understand the nature of reservoir modeling and simulation thoroughly and quickly. We approached all aspects of the project collaboratively and spent most of our time working alongside the subject matter experts, utilizing online tools such as InVision Freehand to collaborate and communicate ideas. Sketching, always start with sketching. Lots of it. We started with reviewing and understanding our identified persona(s). Listening to previous interviews and conducting a few new ones. We quickly realized our users are highly educated engineers and geologists that understand their problems very well but don’t always have the time to tackle them. We were all genuinely excited and eager to solve this problem. Once we had a grasp on our users’ needs and pain points, we gathered the team for an internal 2 day design workout with subject matter experts, product managers and other key stakeholders. This allowed us to quickly understand the day-to-day challenges. The outcome of this workout was user journey maps for our personas and a narrative storyboard. Customer visits and design exploration workouts with internal stakeholders. Persona analysis feature priority mapping. After gaining greater insights to the problem, the users and how we wanted to solve the problem, another product designer stepped in and helped me iterate through several design ideas. These ideas were lo-fidelity conceptual designs that were turned into unrefined testable prototypes. This allowed us to focus on the user flow and ensuring we had the right information for our users to make educated decisions to complete their tasks. MVP workflow through the application to run Multi Well Optimization. These prototypes helped us discover very early on that we had many issues and some wrong assumptions around the conceptual solutions. It wasn’t as easy as we had thought. Some issues that were highlighted were hard to track results, communication channels that were not always open, and the manual processes that still needed to be taken into consideration. Insights from our discovery phase indicated many areas where a web-based solution could help improve the day-to-day lives of our users. If we truly wanted to make a difference in the lives of our users we needed to provide a more holistic solution that would meet more of their needs. The result was in fact a web-based tool that generates multiple recommendation scenarios. 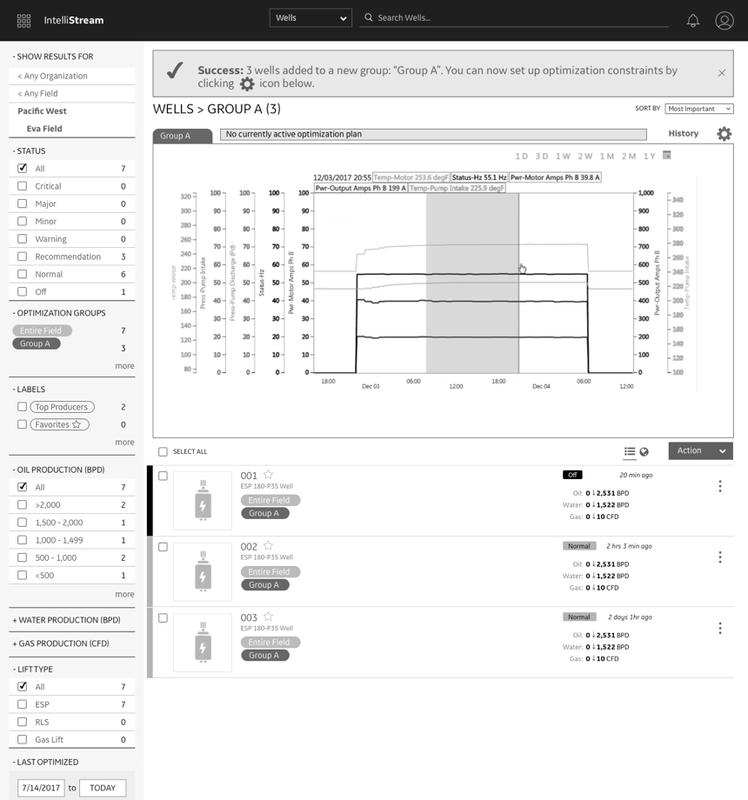 Users can enter manual conditions based on known characteristics of their wells and tweak system recommendations. 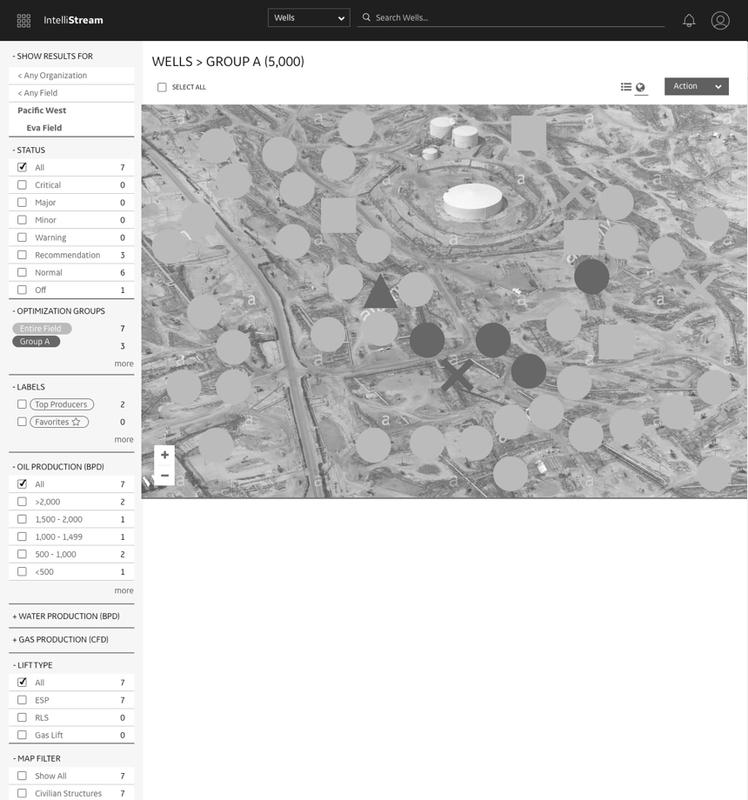 Plan management allows the user to add and track the results; and with machine learning the recommendations get smarter the longer the plan runs. We worked side-by-side with the development team during their sprints to ensure quality assurance and that the designs were translated and executed properly. During this process there were some adjustments based on some great feedback from the development team. Post optimization giving the user insight into current & recommended operating conditions. 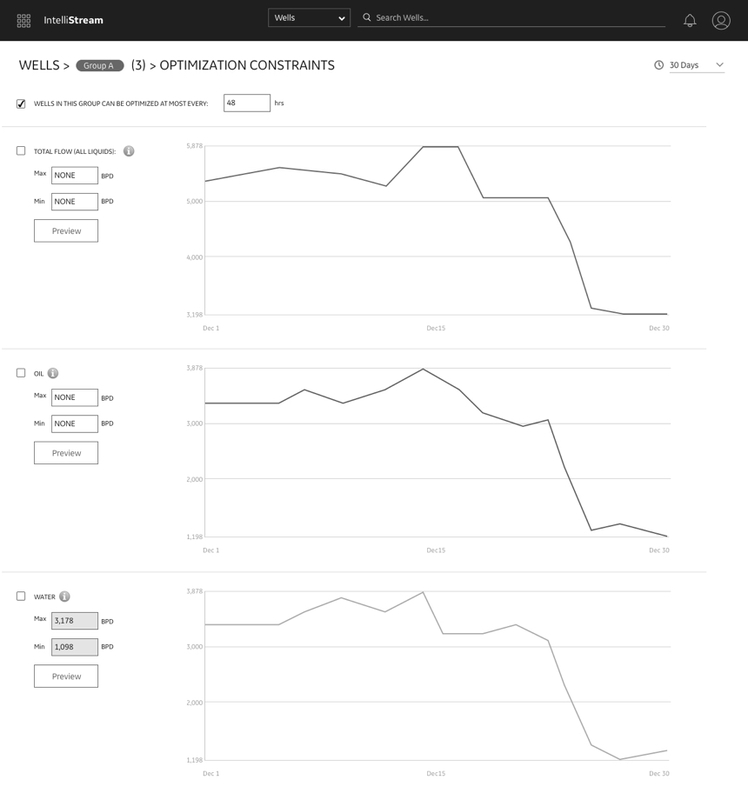 Pre-optimization KPI summary informing the user of trending data with a Sparkline, showing the latest timestamp & oil contribution on hover. KPI summary clearly highlighting optimization results with a total contribution donut chart on hover. 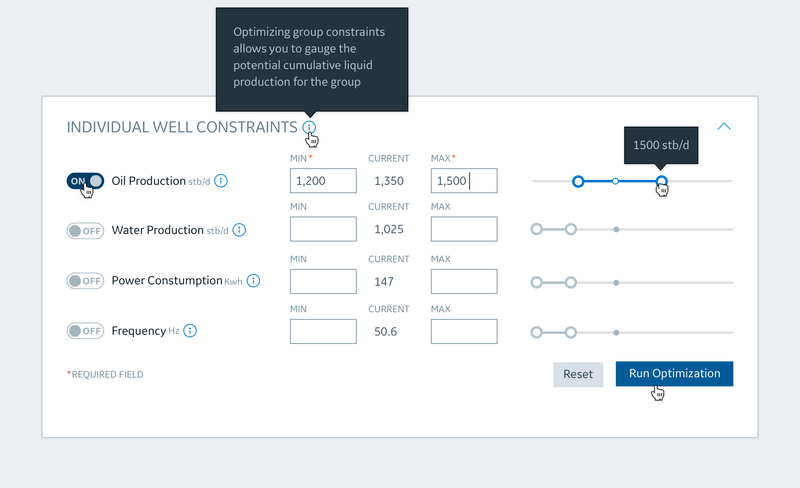 Setting constraints allowing the Production Engineer to run "what-if" scenarios. 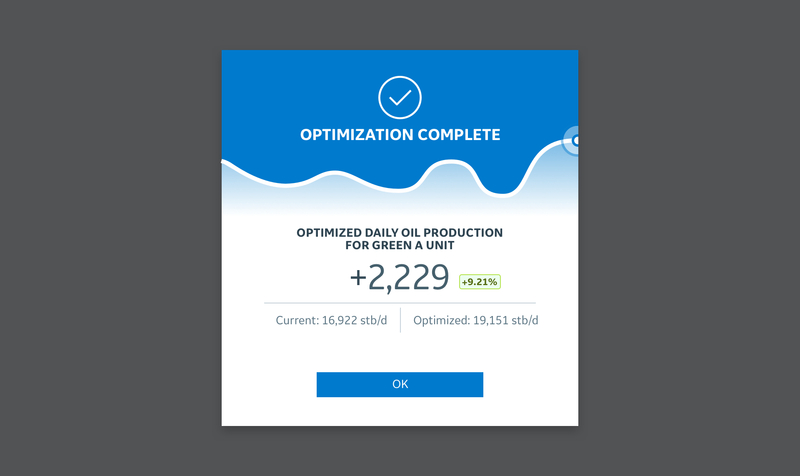 Contextually helping the Production Engineers know how exactly the application is calculating the optimized results. V2 of constraints panel, with added constraints and alert thresholds. Clearly display the current production and what the potential gain of optimized production could be. Production Engineers need insight to Well Details to understand what data was used to calculate the recommendations. Feasible Region Boundary quickly shows the user the best potential optimization point. 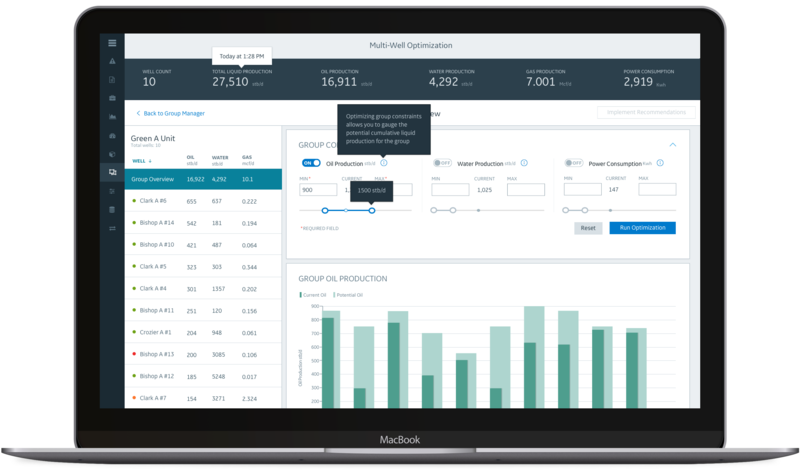 Production Engineers can validate current operating points compared to recommended optimized operating points to help promote trust within the application. About mid-way through working on this project we were requested to start working and testing a new design system that was being implemented. This added another layer of complexity and slowed us down a bit, as the design system was not mature enough to be utilized. We were able to offer some insights and recommendations for the design system, as well as contributing new navigation patterns and components. Double win. Patterns and principles contributed to our design system. We pivoted many times based on feedback from our customers and some executive management decisions. Managing feedback was even more challenging because it felt like a swinging pendulum of viewpoints. The team spent a disproportionate amount of time debating design decisions— when there wasn’t data that could easily be gathered to help drive a decision. We were designing around real customer data sets that came with a lot of responsibility involving the sensitivity of their data. We had to make sure we were mindful of who we were sharing the designs with and who we were testing with. We did have a few slowdowns, such as educating new members of the team who weren’t yet well versed in proper UX & software development processes. Side note: I do always enjoy sharing with others what I’ve learned in my career, and vice versa. This was a new team and it was great to learn and see some really cool ideas fostered amongst ourselves. One thing that I really enjoyed about working on this project was the fact that nobody in the industry was doing this. It required a lot of testing, refining and exploration of fun, and raw, ideas. 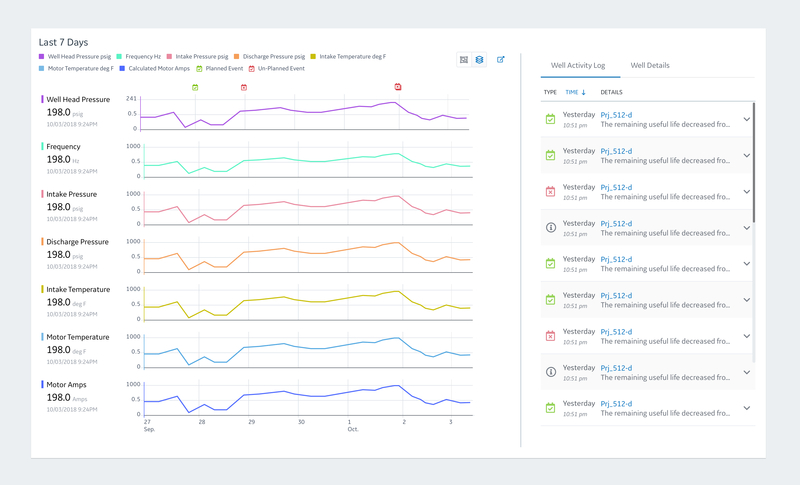 After a two week stint of testing with beta customers we were able to gather insight on how this new feature could better fit within their day-to-day tasks. This also offered up discovery on the next round of features for the next release. 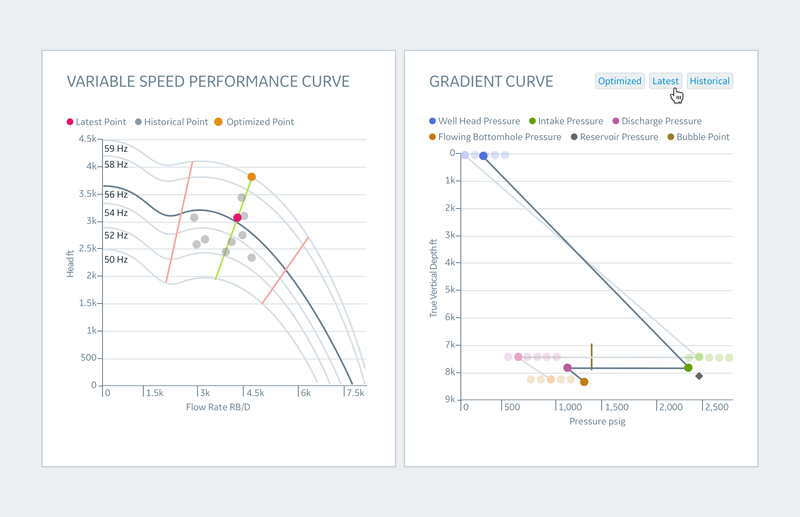 Bullet Graph showing current, potential and optimized. Along with delta. Offers insight into production and overall health of each individual well. This gives the user greater insight if the recommendations are accurate or even possible. Data visualization of the last 7 days key tags and events. This work was done while employed by GE, working in an interdisciplinary team that includes design, engineering, product, data science & research.